In this study we present a method for the localization problem of Autonomously Guided Vehicles (AGVs) in the framework of well-known Simultaneously Localization and Map Building (SLAM) problem. Methods that are using odometer and IMU together still open to development because of incapability of obtaining significant noise-free measurements from ordinary IMU sensor. Nowadays localization techniques for industrial AGVs are also include specific Landmarks that brings big amount of precision for particularly indoor since that allow sparse mapping without future extraction efforts. This property is also useful for implementation of estimation tools such as Kalman filtering. Our work is based on EKF based localization of based on landmark detection, odometry and IMU measurements together. The proposed method is tested on our AGVs experimentally equipped by various sensors for some navigation scenarios successfully. A change in essential operating parameters of a high speed direct injection turbocharged diesel engine MAN D0826 LOH15 during the injected fuel mass flow variation was presented. Based on two measurement sets, performed with standard diesel fuel, several operating parameters were calculated: engine torque, effective power, excess air ratio, specific effective fuel consumption and heat released per engine process. All of the calculated parameters are presented for a wide engine operating range. Along with calculated, several important parameters were measured, in addition to those presented in measurement sets. Additional measured parameters were lubrication oil temperature and exhaust gas temperature before and after the turbocharger turbine. Those calculated and measured parameters allow deep insight not just into the engine process, but also in the process of turbocharging, which is very important in the analyzed diesel engine operation. Correlations between some basic quality parameters of a drug product, which are very important for the pharmaceutical manufacture of solid dosage forms are studied, on the base of experimental data from 135 batches. Factor analysis, control charts and histograms are implemented for the quality parameters – strength of tablet, assay of the active substance, acid resistance, disintegration), water content, drug dissolution after 150 minutes and drug dissolution after 165 minutes.. The parameter drug dissolution after 120 minutes is dropped from the analysis, because it was observed to have a zero value for all measurements. The main aim of this article is to search for a possible underlying structure in the variables with exploratory factor analysis, to monitor whether the quality parameters’ variation is consistent and the empirical distributions of the most important quality parameters using control charts and histograms. In the present paper the general characteristic movement of automatics of a shot is discussed, and an analysis is given concerning the laws of the movement of the weapon mechanisms. 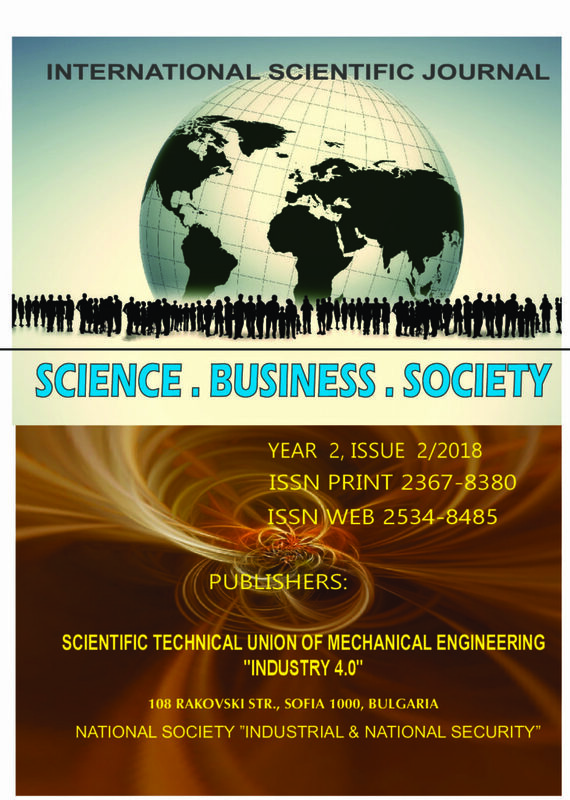 The goal of the research is to evaluate the influence of country of origin effect on export of high-tech mechanical engineering products and competitiveness of the machine building enterprises abroad. The article deals with the foreign economic activity of JSC “PA “Ural Optical & Mechanical Plant” named after E.S. Yalamov” – large industrial enterprise of Sverdlovsk region in Russia. The authors use methods of case-study and economic analysis to determine the competitiveness of medical equipment abroad and dependence of export sales on the perception of country brand “made in Russia”. As a result the schemes of subcontracting and production under Private Label Manufacturer for the high-tech machinery with obligatory international certification are offered. These instruments can help to increase the export potential and competitiveness of the Russian machine-building enterprises under the conditions of new industrialization and globalization. Liner shipping industry is characterized by increased market concentration and cooperation. Maritime operators apply various forms of cooperation for maximizing revenues and achieving operational efficiency. The present article analyses the benefits of using Vessel Sharing Agreements in container transportation. Shared services agreements of leading liner operators are studied. The results show that Vessel Sharing Agreement application leads to higher transportation efficiency in terms of costs minimization and service reliability. The machinery in livestock farming works in a highly aggressive environment, increased ammonia content and high humidity. Anticorrosive protection of machines and equipment is widely used on the basis of lacquer materials. Their effectiveness is mainly determined by the selection of the varnish materials according to the type and degree of corrosion hazard. Modern lacquer-based materials based on melamine, pentaftal, nitrocellulose, butyl methacrylate, chlorovinyl, epoxide and other resins are characterized by high protective properties and the possibility of renewal. The purpose of this report is to propose possible engineering solutions for the construction, reconstruction and modernization of the existing irrigation infrastructure in our country . These solutions can assist beneficiaries in the application process for the Rural Development Program 2014-2020 under sub-measure M4.3 "Support for investment in infrastructure related to the development, modernization or adaptation of agriculture and forestry". In order to achieve this goal, the state of the existing irrigation infrastructure has been analyzed and the specifics of the irrigation systems in our country have been assessed. Based on this several model systems of different type and construction were selected. For some of the irrigation fields, possible technical solutions concerning their completion, reconstruction and modernization have been analyzed. The main issues are considered in this topic:. Creation of new methodology conditions of global economic security on a base of management that resemble natural ones. In order to establish the aggregate and average daily values of raspberry evapotranspiration in an experimental site in the village of Chelopechene – Sofia, drip irrigation studies were carried out on a replanting variety "Liulin" under different irrigation regimes – from full satisfaction of the daily needs of the culture from water to irrigation with 20% and 40% irrigation norms. The meteorological conditions during the study period showed an influence on the sum of the sum and day-to-day values of the culture evapotranspiration. For the needs of practice and design, the ten-day values of the biophysical coefficients Z and Kp were calculated over a five-year period. The Middle East is a geographical region which can be defined in more than one way. Depending on various factors such as security, politics, or economy, the Middle East might stretch from Morocco to Pakistan (the Greater Middle East, coined in the early 2000s) or, according to a more traditional, Orientalist definition, from Egypt to Iran. The definitions also vary as to which countries on the African continent should be interpolated into the Middle Eastern region. While the geographical range of the Middle East is disputable, one criteria of the definition is unchallenged, and this is the lack of stability of the region. At the epicenter of this instability is the Israeli-Palestinian conflict. When Israel was established as a new state in the region in 1948, there was a broader Israeli-Arab conflict. And, while the Israeli-Palestinian conflict applies to merely 20.000 km2,, in its specificity, it radiates onto the whole region – once a local conflict, then a regional one, and eventually gaining a global inflammation rank (Bojko, 2006). It is also at the heart of the followers of Islam (the religion with the second biggest population) and draws attention of policymakers globally, who for the last seven decades, have failed to find a solution to the conflict. The Israeli-Palestinian conflict, because of the magnitude of issues involved, is often not fully comprehended but it still evokes stark, polarized opinions. The intricacies of the conflict have their direct root in the previous century, but both sides of the conflict, in reinforcing their rights, go back not decades but centuries. The conflict itself has been also used by third parties e.g. during the Cold War, or as the pretext for carrying out the attacks on 9/11. The Israeli-Palestinian conflict is complex, it affects many people, not just locally but also globally. Therefore, explaining the Israeli-Palestinian conflict through ten basic criteria will allow us to understand the complexity of the conflict and to formulate our own opinions and positions on this difficult subject.